Ice storms and blizzards can snap power lines just as easily as any hurricane, spawning prolonged power outages during the darkest days of the year. You don’t have to look too hard to find someone who’s weathered a winter power outage. Just ask me. A few years ago, my family endured a 4-day power outage, turning my home into a walk-in freezer. When the power went out, so did our electric-powered blower. So even though we had a natural gas furnace, it was rendered useless during the height of the blizzard. During a blizzard blackout, you can’t just jump into your car and rent a backup generator. 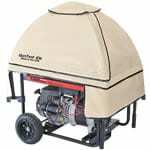 If you live in snow country – especially areas hit by wicked ice storms – you need to have a backup generator on site before the first snowflake falls. Be prepared and stay up and running during your next winter blackout. Keep it Under Wraps Don't let your generator go unloved. Keep it from being buried in snow and pelted by sleet in winter, and keep it dry through the spring, by covering it with a GenTent. GenTents are custom designed to fit your particular model of backup generator. They have flaps and cut-outs that are strategically placed to maintain airflow, allowing your generator to stay cool while protecting it from Mother Nature's harsher elements. 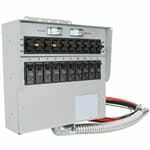 If you purchase a portable generator, make sure you purchase a manual transfer switch too. Why? Most furnaces don’t have electrical outlets. You can’t plug your generator into your furnace… or ceiling fan… or light fixtures. You simply start your generator outside, run a heavy-duty cord to your transfer switch, and voila… your furnace and lights are restored. 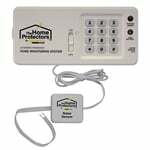 Finally, if you're away from home often (like a vacation home in the mountains), buy a simple temperature alarm that will call you if the power goes out or the inside temperature drops significantly. We were rightfully concerned about the water pipes freezing. Water expands when frozen, and the pipes can rupture and flood the entire home. An early warning can literally save you thousands of dollars in damage later. Maybe you need more gas for your generator, or perhaps you just want to clear a place to set it up. Whatever the reason, you're going to want to leave your house at some point, and the two or three feet of snow out there is going to make things difficult. Unless you're a glutton for punishment, you're probably not going to want to shovel your way through the waist-deep snow. 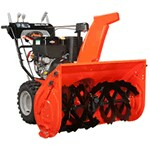 A powerful snowblower is the perfect tool for the job. Find one that's right for you, and you'll actually enjoy clearing the driveway, the sidewalk and maybe even use it to help the neighbors dig out too. How to survive a blizzard blackout. With the help of the generator experts at Electric Generators Direct, you won't have to suffer through icy, frigid temperatures without power. Be prepared this winter and install a backup generator, so if, or when, winter storms knock out your power and heat, you'll be able to put the lights back on and stay warm.